Scholars and students are welcome to visit the Kelso Museum of Near Eastern Archaeology and Barbour Library to pursue research in the Museum and archival collections. Those wishing to work with the Museum's collections, please contact the Museum at museum@pts.edu to discuss your project and arrange for a visit. You can also schedule your tour online and select from a list of available activities. The staff is happy to work with teachers to meet the interests and needs of their classes. Please contact the Museum at museum@pts.edu to plan a visit. Six fully provenienced assemblages excavated between 1926 and 1981 form the core of the collection, with small collections of provenienced materials from an additional four. Tell Beit Mirsim was sponsored by Pittsburgh-Xenia Seminary between 1926 and 1932, with William Foxwell Albright of the American Schools of Oriental Research as director and Melvin Grove Kyle of the Seminary as President. It was at TBM that Albright refined the chronology of Palestinian ceramics that is still standard for dating in the region today and where he established a reputation as the leading biblical archaeologist of his generation. The artifacts held by PTS include a full range of materials, dating from EB to 700 BCE when the site was abandoned. There are 1038 registered objects in the collection plus 18 2-cu foot boxes of unregistered sherds, and five boxes of unregistered metals. The results were published by W. F. Albright in four volumes between 1932 and 1943. Beitin (Bethel) was excavated by Albright and James Kelso of Pittsburgh-Xenia Seminary in 1934, with more modest seasons by Kelso in 1954, 1957, and 1960. Artifacts range from Chalcolithic to Byzantine; 922 are registered with 30 additional boxes (12 x 6 x 3 1/2 cubic feet) of unregistered sherds. Alayiq was excavated by Kelso in 1950 and identified as the site of Herod's winter palace at Jericho as well as of earlier Hasmonean palaces (thus, 200 BCE-70 CE). Kelso's work brought to the museum architectural fragments and artifacts that testify to Herod's cultural/stylistic allegiance to Rome. The collection includes 220 registered objects and 4 cubic feet of unregistered plaster fragments that reveal the palette of the palace. The first objects in the collection from Bab edh Dhra were picked up in 1924 during a survey of the Dead Sea Plain conducted by Albright and Kyle in search of Sodom and Gomorrah. In 1965 and 1967 the site was excavated by Paul Lapp, who discovered a large cemetery with four distinguishable periods and a village and town site. After Lapp's untimely death in 1970, Thomas Schaub and Walter Rast continued his work and expanded excavation to neighboring sites on the Dead Sea Plain. As a result of donations from the Lapps, the acquisition of tomb groups from ASOR and recent transfers from the Expedition to the Dead Sea Plain, the collection now includes eight tomb groups, representing the entire span of the EB. There are 250 registered artifacts, and another 350 vessels are being processed, as well as beads of stone, bone, and shell. PTS also holds 67 cubic feet of sherds that served as the basis of the 2004 Town Report. Curator Emerita Nancy Lapp and co-author Tristan Barako are currently completing a final report for Rumeith, an Iron Age site in northern Jordan excavated in 1962 and 1967 and left without full interpretation when Paul Lapp died in 1970. The Rumeith collection includes a significant number of stone vessels and tools and ceramic vessels and sherds that are currently being processed. 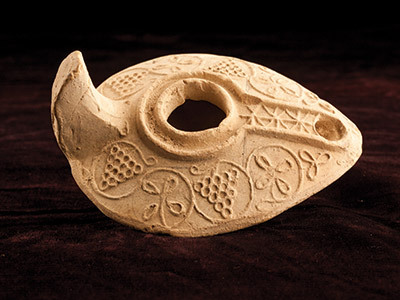 In addition to these core collections, the museum holds small collections of published artifacts from Ashdod, Tel el Ful, Wadi el Daliyeh, and Ghassul, as well as 2078 artifacts registered and described but without full provenience. The museum holds 15 linear feet of primary records of the core excavations including day books, diaries, drawings, maps, correspondence, and account books, as well as 5,000 photographs—prints, negatives, lantern slides, and 35 mm slides. It has rare 16 mm movie footage of the excavation at Tell Beit Mirsim in 1930 and Alayiq in 1950.